"Growing up in New Mexico, we had access to the Hatch green chile (the best!). 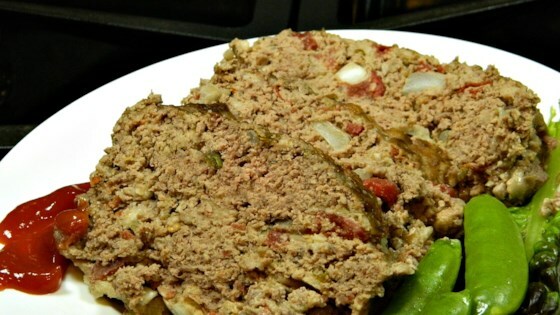 I add green chile to a lot of my recipes and it rather sets this meatloaf off. It's very good cold, made into sandwiches the second day." Preheat oven to 350 degrees F (175 degrees C). Grease a loaf pan. Mix hamburger, tomatoes, green chiles, onion, milk, eggs, crackers, salt, and pepper together in a bowl. Transfer to the prepared loaf pan. Bake in the preheated oven until until no longer pink in the center, about 1 hour and 10 minutes. An instant-read thermometer inserted into the center should read at least 160 degrees F (70 degrees C). Let cool in the pan for 10 minutes before transferring to a serving dish. If you can find them, use Big Jim Hatch chiles, roasted, peeled, and diced. I haven't made it yet. I just wanted to let people know that you can get Hatch Chilis from them. Look them up online and you can get them year round. I will be trying it soon.